Today I’m here to share my Cozy Christmas Screen Porch as part of the “Baby It’s Cold Outside” Home Tour hosted by Barb of The Everyday Home and Susie of the Chelsea Project. 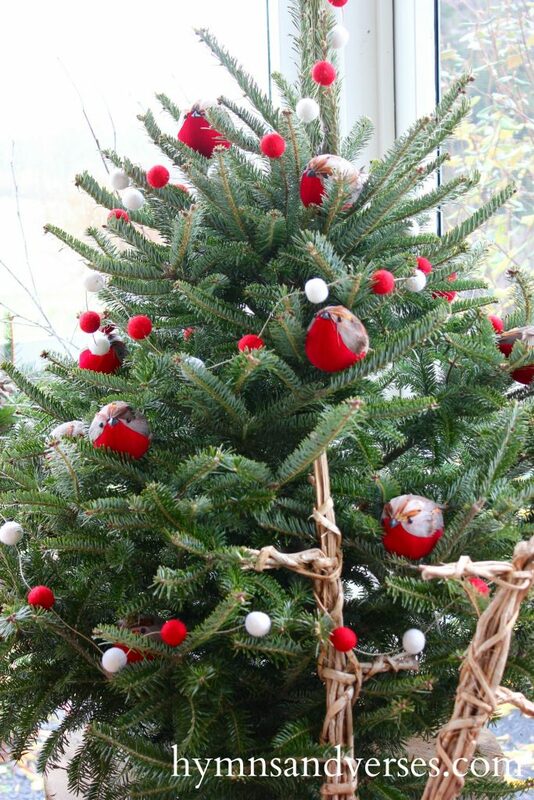 At the end of this post, you’ll find links to all of the other homes on this fun, all outdoors, Christmas tour! A lot of home tours are centered around the mantel, the dining room table, or the family room. We thought it would be fun to tour the areas outside of the home . . . porches, patios, and beyond. Bundle up, because “Baby it’s Cold Outside”! The day I had scheduled to photograph my screen porch, was truly a day to be bundled up. 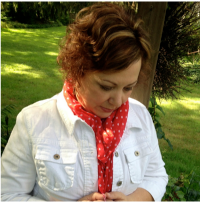 A cold and rainy day – so I hope you don’t mind the raindrops or the puddles! The first thing I knew I wanted to do on my porch this year was hang a pine tree branch from the rafters. Because I’m just a bit afraid of heights, I had Mark hang the branch for me. Of course, I stood back and had him raise and lower the branch until it was “just right”. I’m so thankful for a husband who tolerates my crazy decorating ideas! I used twine to hang some white washed wood stars from the branches. It was so hard to capture the stars clearly as they twirled around by the breeze! I made all of the pillow covers for the porch. I discovered a new fabric shop and found the grain sack style fabric and the red ticking there. 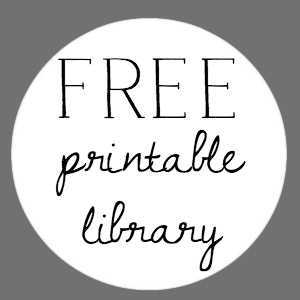 I love pillow covers that can be removed, laundered as needed, and are easily stored away. 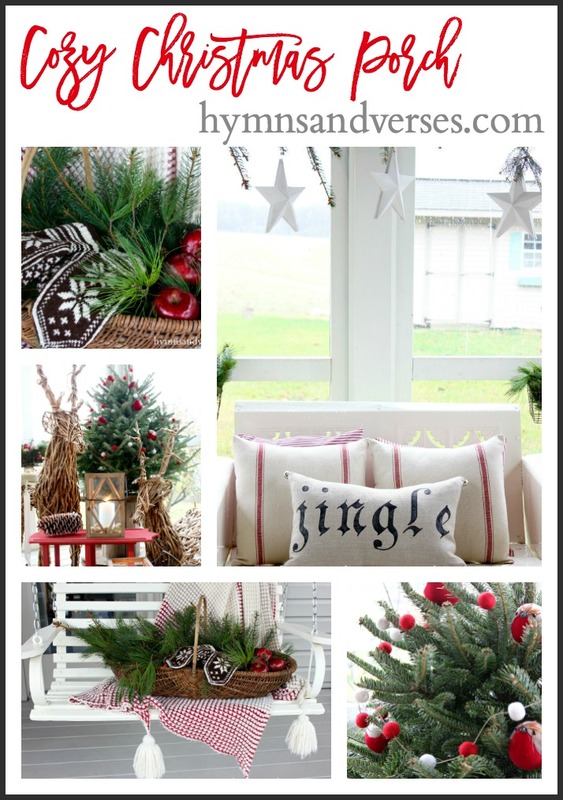 The “jingle” pillow is a cover is one that I made for sale in my Etsy shop years ago. I haven’t been selling pillow covers as much lately, but I still like to make them to use in my own home! 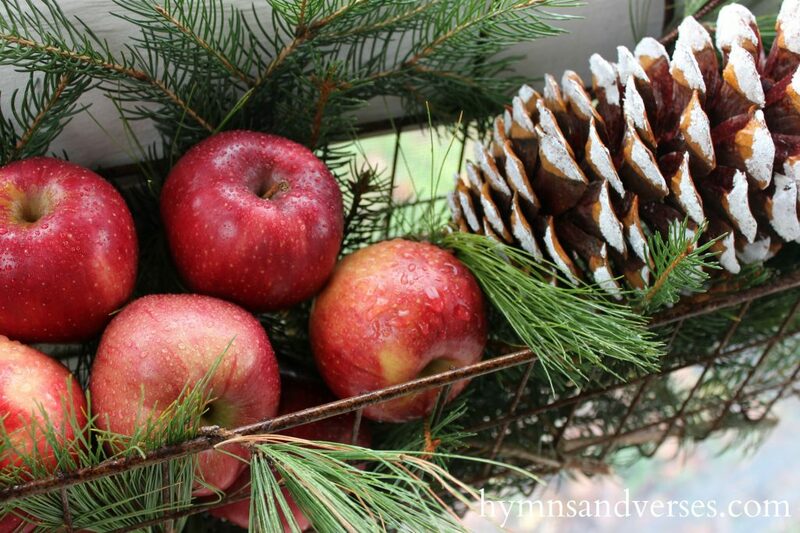 I filled the wire window planters with fresh pine, apples, and sugar pine cones. I’ve had these grapevine reindeer for probably 15 years. It’s been a few years now since I’ve used them in my Christmas decor, so I thought it was time I pulled them out of storage to feature on the porch. They were a Christmas gift from my husband and three boys. They really surprised me that year with this gift! There was a huge Christmas display at a local shop that was magical to littles. I took the boys there one day and when I saw these reindeer, I must have said something like “oh, I like those reindeer”. Apparently, one of them remembered and told Dad. They were quite excited to give me my gift that Christmas morning because they knew I would be surprised and happy! The little Frasier Fir tree trunk was the perfect size to fit inside the center hole of my old wooden spool. The spool gives it just the height it needed. I found these cute, chubby birds at Michaels and couldn’t pass them up at 60% off! I also added a felted wool ball garland. I purposely didn’t add lights to the tree because I didn’t want to bother with the cords, but now I’m thinking it would be nice to have some extra twinkle on the porch – so I guess I’ll be “rigging up more lights” this weekend!!! There may not be lights on the tree (yet), but there is nothing like the cozy glow of a real candle. 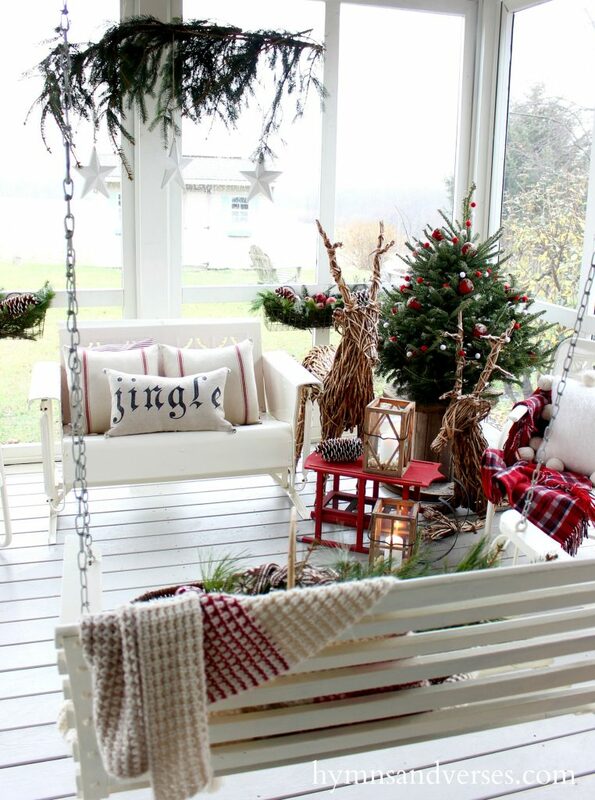 There’s nothing like a warm and cozy throw on a porch swing. 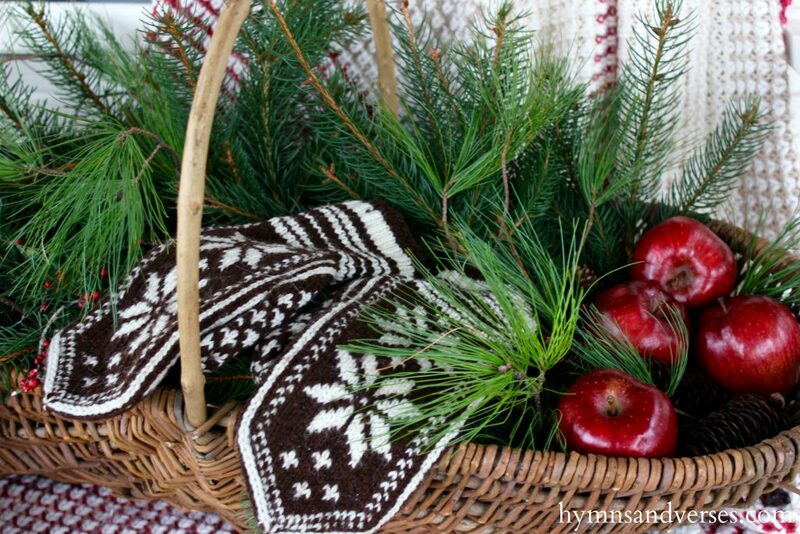 I filled this “new to me” basket with fresh greens, berries, apples, and pinecones. I found these vintage wool mittens a few years ago at a local antique shop and love how they look tucked inside the basket. Thanks so much for stopping by today to see my Cozy Christmas Porch! Below are all the links for the “Baby it’s Cold Outside” Tour. 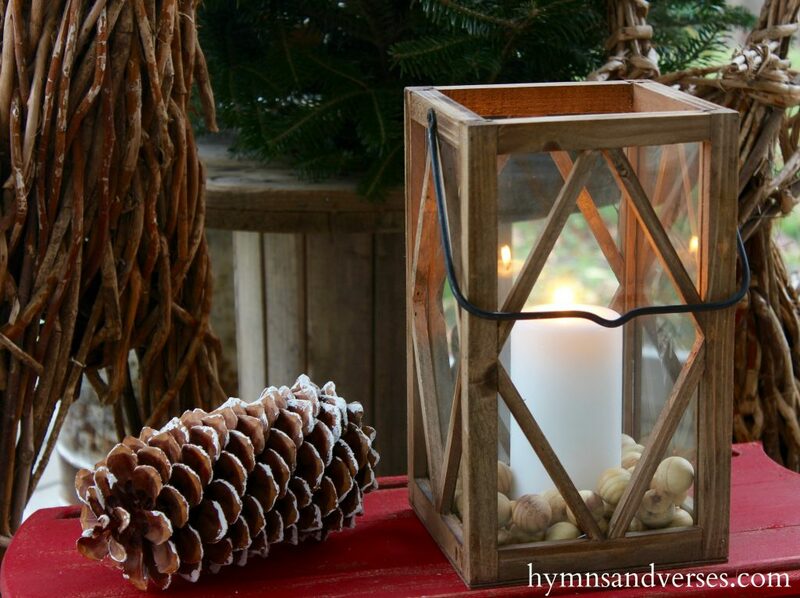 There are so many creative ideas for making our outdoor spaces festive! I wasn’t able to share my Christmas kitchen and living room yesterday because of a technical issue and my blog was down most of the day. So, I’ll be back tomorrow to share those spaces all decked out for Christmas. Thank you so much, Susie! Thank YOU for everything you did to put this fun tour together! Doreen, it’s always fun to see what you do on your porch as it is always fun. Thanks so much, Kim!!! I love to get creative out there! I too love waiting to see how you decorate your porch and always love what you come up with! Everything is beautiful and I always love your diy projects! :)Thank You for sharing! I always love your porch decorated for Christmas. Each year is beautiful! What a sweet little tree. I loved that chubby, little tree the moment I saw it!!! Thanks so much for your sweet comments, Sherri! Merry Christmas! 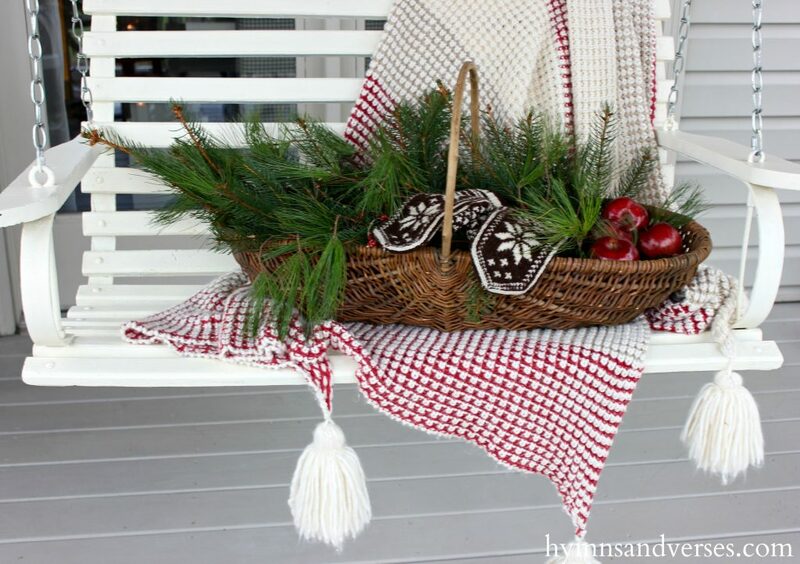 Doreen, I always look forward to seeing how you decorate your porch each season! 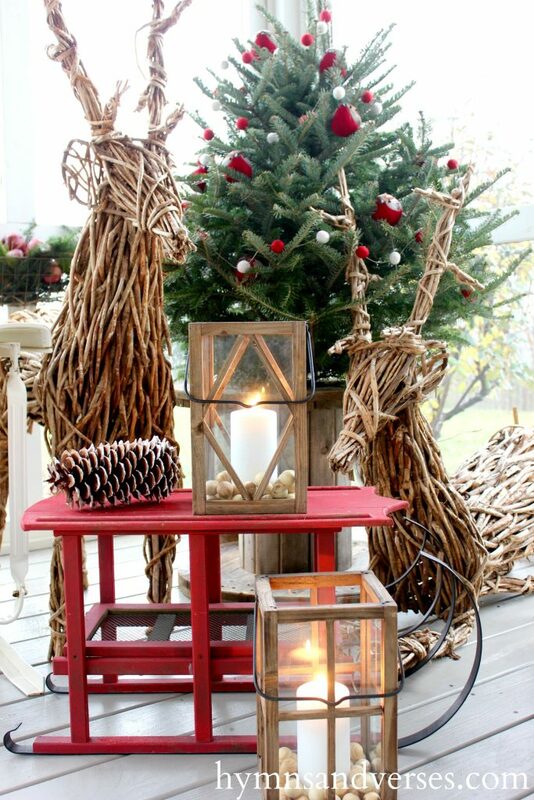 Those twig reindeer look quite at home out there and that was a sweet story about how you were gifted with them. Love that new fabric that you found to make your pillow covers. Now that I have a machine, I want to attempt to make some covers soon! Oh my goodness, I LOVE your post! What a gorgeous porch you created! It is so pretty and I love that you made your pillows from authentic grain sacks. Also, your story about your grapevine reindeer is so cute! 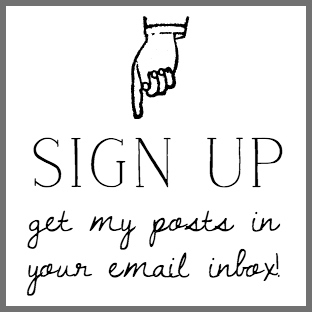 Lovely posts and you have a new fan! Thanks so much, Janine! Merry Christmas to you and your family!!! I always look forward to seeing your porch decorated for Christmas! I love the story of the reindeer gift. That makes them extra special! 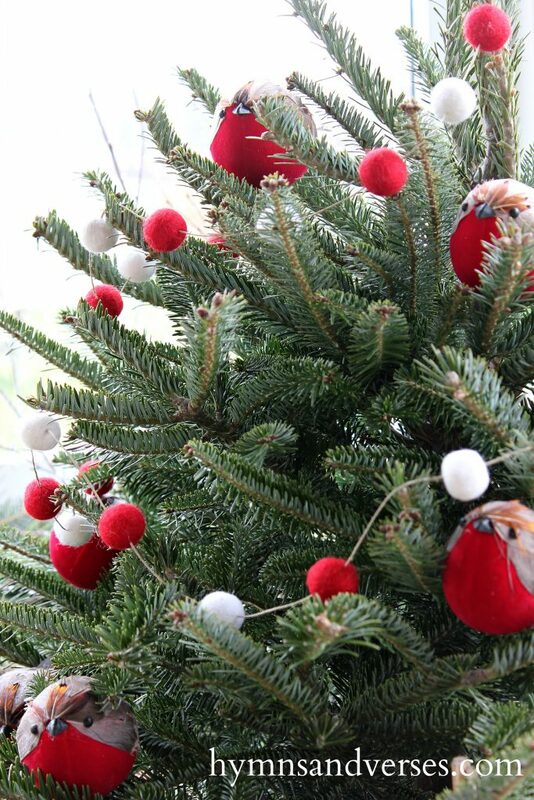 The red and white pom pom balls on your tree are so cute! You always do such an amazing job!